I have to admit that in addition to my summer routine of eat, sleep, paddle I have been enjoying some great books. Here are 3 that I have recently enjoyed about Women on Water. Whether by canoe, raft or kayak, solo or supported, fearful or fearless; determination is the underlying current in all of these books. Keep it Moving is a tale for anyone who likes a good adventure story of physical, mental, cultural, and meteorological struggles and triumphs of the human spirit. My description sounds cheesy but this really was a book that I looked forward to reading every evening. 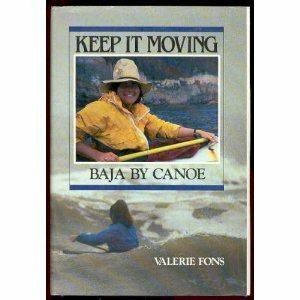 Valerie Fons' chronicle of her Los Angeles to Yuma paddle around the Baja penninsula with Verlen Kruger gives one a real picture of many of the trials and tribulations of expedition paddling and also insight into the personal growth that often happens as a result. Anyone who has been to the Grand Canyon knows the magic that it holds. It grabs all of us in a special way. For many years, women were not given the opportunity to oar boats as guides in the Grand Canyon. This book describes the stories of 11 women who "broke into the current" to guide rafts and dories in the Grand Canyon. This is a must read for anyone who feels the lure of the canyon and those that enjoy tales of women on water. I have to admit that Fearless was not on my must read list. I tend to like stories where the underdog struggles but perseveres. Freya does not portray herself as an underdog and one realizes that is one of the reasons she is so remarkable. Unlike many women, she believes 110% in herself. Joe Glickman surprised me with his candor about Freya's solo circumnavigation of Australia. Reading the book, I realized that she was an underdog (although not by her perception) that accomplished a great feat. I picked up Fearless on a recommendation from a fellow woman on water. After sharing my 2 cents on it, I came across the Fat Paddler's review of Fearless. I found his thoughts on the book very similar to mine. Here's a link to his review. Please comment below if you have any reading recommendations for me. If you want a short woman on water read, be sure to pick up the Summer 2012 Issue of California Kayaker Magazine. There is an article about kayaking the Eel River by a woman on water that you might know. It pales in comparison to the accomplishments and journeys of the women in these books, but one that I hope you enjoy reading. A tale from our kayak adventure this spring in the Grand Canyon. At mile 150, we encountered Upset Rapid. We stopped to scout it because the oarsmen were concerned about a large hydraulic in the middle of the rapid that is known to upset rafts. Jeff and I enjoyed these moments to scout so that we could pick what would be the funnest line rather than reading and running and wishing that we had taken another line. As we scouted, sure enough the middle of the rapid contained some good sized waves that fed into a large wave hole with recirculating water behind it. To the right was a sneaker route. One could hug the right bank and miss out on the surging wave hole in the middle. The left line along the river wall looked like a fun wave train with lots of lateral wave action and a chance to skirt the large wave hole in the middle. Jeff had selected the left route, but I was jonezing for some action. Like everyone, I had Lava Falls (mile 179) on my mind and wanted to test my skills before hitting it. So “Hey-Diddle-Diddle-Down the Middle” was my line selection. Our rafts had mostly decided to skirt down the right side to avoid an upset but hung out to watch our run. As usual, Jeff went first and carved among the waves and launched off the tops of them. He had quite a fun line and a clean run as he skirted the big hole in the middle. I was determined though to blast down the middle and see what the hole had in store for me. Hey diddle - I put myself on course to run down the middle. I glided down the middle of the rapid. As I got ½ way to the hole, I saw a small seam in the hole and drove for it. As the current surged the seam disappeared and the wave hole reared up and curled back on itself. I powered in to hit the seam and drive through the whitewater but the wave hole reared up and threw me backwards literally flipping me end over end in what play boaters call a loop. The wave barrel-rolled me and imploded my spray skirt. Yes, Sandeen's whole 18 foot raft disappeared into the wave hole (all you see is him in this photo). Yes, he and his crew came through wet but upright. This sums up my summer pretty well. It has been an awesome 2 weeks teaching and guiding lots of great kayak trips on the Mendocino Coast. and lots of great wildlife sightings. Today, I am enjoying a non-paddling day. Trying to catch up on housework, bookkeeping, photos, blogging, and gear maintenance.